What delicious little bacon wraps. Most people use these as appetizers. Which of course is a terrific idea but I started to use them as a main course. Served with any kind of potato, veggie and a salad, they are super. Of course don’t forget breakfast. To wake up to the smell of coffee and these baking in the oven. WOW! Easy to make and a real treat. These are the one thing on a plate that won’t be leftover. Give them a try. Take and cut the bacon in half. 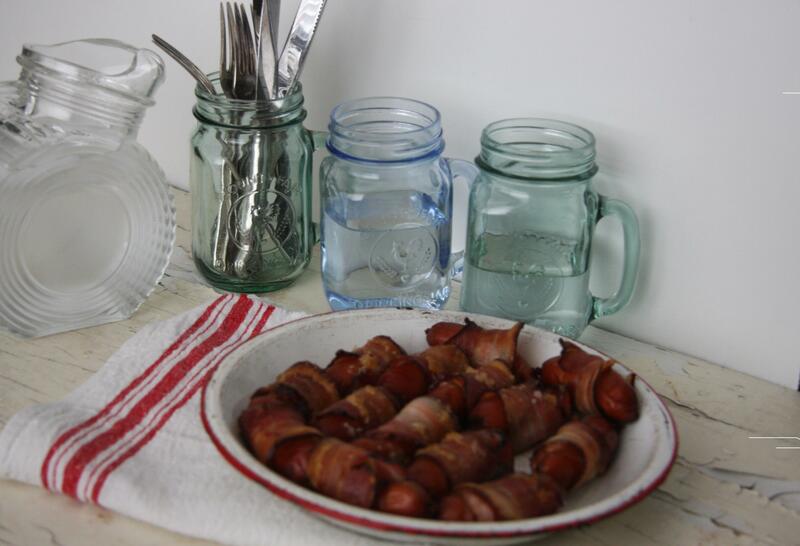 Wrap each mini sausage with a strip of bacon. 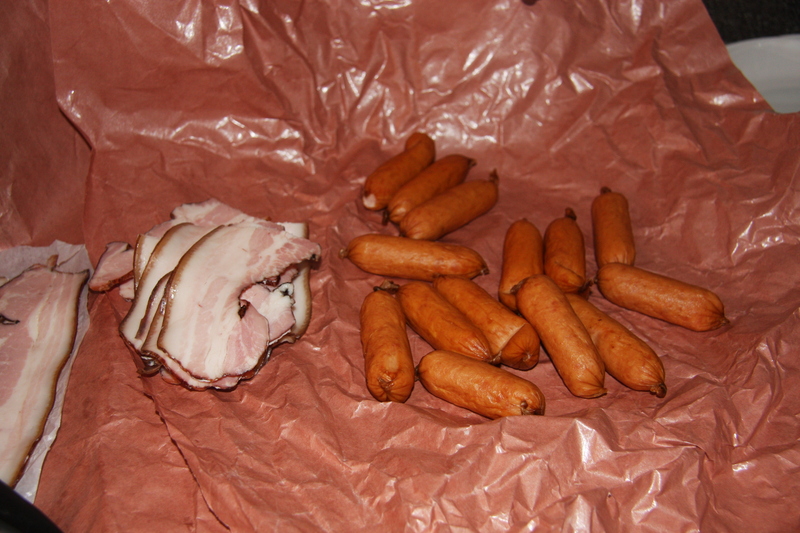 My bacon was from my favorite deli, Super Sausage and it was double smoked. AAHH heaven. Place onto a baking sheet and sprinkle with brown sugar on each sausage, as much as you would like. Bake in a preheated oven at 350 degrees for 30-40 minutes. Remove and serve. See, fast and easy. Give it a try. This recipe can be adjusted to your need and also made ahead so all you have to do is pop it in the oven when you need it. 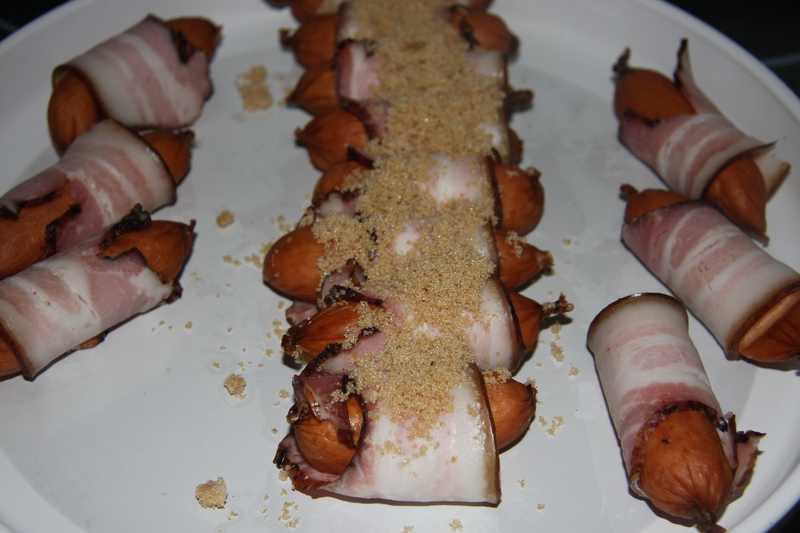 Cut the bacon in half and wrap around each sausage. Place onto a baking tray. Sprinkle with brown sugar and bake for 30-40 minutes at 350 degrees. Serve immediately.